2016 release. 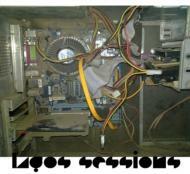 Night School is extremely proud to work with Billy Bao and Munster to present Lagos Sessions. Experimental; Conceptual? That's what these sort of things are usually called, when references are anything but immediate: in the feeling, hearing, and seeing, especially by many. Even more troubling, when the accustomed in us gets ajar... We lack articulation of the seemingly unfamiliar! Even at that, I think the most charitable review of this live electronic exploration will suggest the four sections bordering on insanity. How else? Even when not a few self-styled patriots were booking their flights out of the country, with an election looming to signal the end of a nation, and a band of modern day faith-heads detonating grenades in every other street corner, two dreamers swim against the currents and sneak through the lagoon into the country collecting inputs of derelict art; of garbage can noise; of hooting; honking horns on screeching brakes squelching tar; rackety generator booms? For an imagined program! What's that? Who, what do these doods think they're doing with Lagos?! I'll call it rebirth. That simple. How to find a center here? The output? The hum-drum of the street's daily accent compels the sense of the immediate, the terrestrial; and then those primitive, primeval-seeming echoes of the earliest beginnings of the big bang and it's wave-sound simultaneously releasing Sun Ra's reverb sensation of end time! This should not be danceable but these guys are suggesting the possibility of rhythm in the inchoate. Believe me, you can't miss the Lagos Faaji, Sakara flow, Awurebe, Afrobeat slices; it's jazz, highlife/ Euro- Afro funk/rock/rap and seedy night echoes too. But in their otherworldly dimension. No matter the accolades, I will encourage a therapy of some sorts to the creators of this production. Sola Olorunyomi, poet, bassist.